Your mouth is an intricate puzzle that fits and works together perfectly. It’s especially important to keep your permanent adult teeth healthy, clean, and strong so that they can fully perform each of their functions. To understand why excellent dental hygiene is critical to maintaining a strong smile, your dentist thought it would be helpful to review 4 types of teeth we all have in our mouths and each of their roles. Wear a mouth guard if you play sports. Avoid opening packages with your teeth so they don’t experience dental damage. Thirdly, you have your molars. Their primary function plays a crucial role in the digestive system by helping you chew, grind, and break down food. It’s critical to floss in between these teeth! It can be difficult to reach your very back teeth, but there are tools that can make flossing easier. 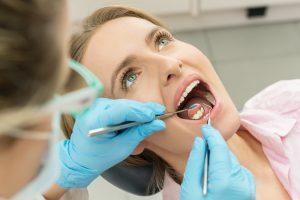 Some people may have enough space for them to develop and come into your mouth fully, but your dentist may recommend having them extracted if you experience dental pain throughout their development. It’s important to appreciate what every one of your teeth does for your smile. Show your teeth and gums how much you care by scheduling an appointment with your dentist every six months and taking great care of them at home. Dr.Drew Vanderbrook is committed to a high standard when it comes to providing dental care to his patients. After completing his educational programs, receiving honors, and holding many roles in organized dentistry, he continues to strive for excellence in his dental practice. If you would like to meet with Dr. Vanderbrook, contact Vanderbrook Family Dentistry by dialing (214) 821-5200.